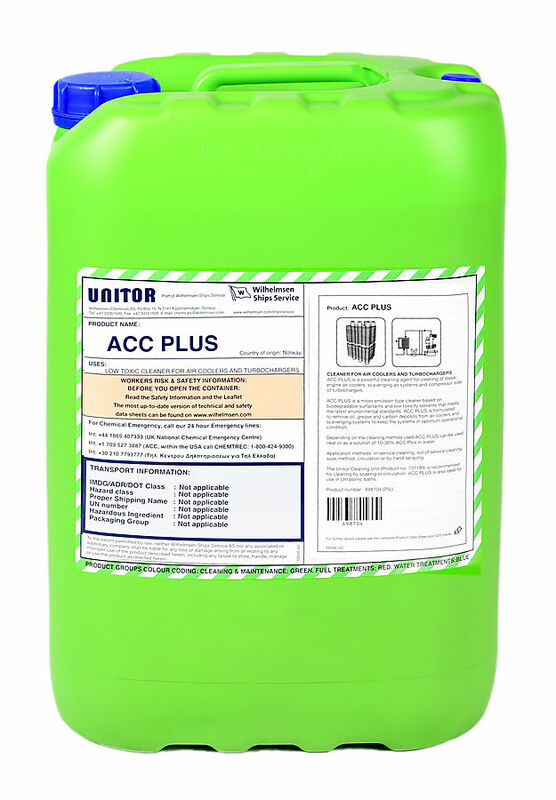 Unitor™ ACC Plus™ is a microemulsion type cleaner, where a synergistic blend of biodegradable surfactants and low toxicity solvents replace the use of the harmful solvents traditionally used in air cooler cleaners without reducing the cleaning performance. It is formulated to meet the latest environmental standards, and is non toxic both to the environment and to persons handling it. Unitor™ ACC Plus™ contains no chlorinated or aromatic hydrocarbon solvents, nonylphenol ethoxylates or other substances harmful to the environment. – Leaves no residue and has no harmful effect on engine. May swell rubber and synthetic rubber. For this cleaning procedure the engine needs to be stopped and secured. Permanently installed spray nozzles in combination with a cleaning solution tank and pump, such as the Unitor™ Chemical Cleaning Unit should be used. It is advised to blind off the cooler outlet. Properly mix water and 10-30% Unitor™ ACC Plus™, depending on the severity of the contamination, in the tank. Connect the pump’s outlet to the nozzle assembly and the air cooler drain to the tank. Start the pump and spray the solution through the nozzles over the entire surface of the cooler and drain back to the tank. Circulate the solution for a period of 1 to 6 hours. After cleaning, rinse with fresh water. Remove the outlet blind and disconnect the pump and tank loop. For this cleaning procedure the engine needs to be stopped and secured. Blind off the cooler outlet and flood the cooler with a solution of 10-30% Unitor™ ACC Plus™ in water depending on the severity of the contamination. Soak for a period of 1 to 6 hours and drain to slop tank. Agitation by means of steam or compressed air will improve the cleaning effect. After cleaning, rinse with fresh water. Remove outlet blind and close drain. Remove the cooler from the engine and place in a soak bath filled with a solution of 10-30% Unitor™ ACC Plus™ in water for a period of 1-6 hours. Agitation by means of steam or compressed air will improve the cleaning effect. After cleaning rinse with fresh water and reinstall the cooler. This method is also suitable for machine parts with stubborn carbon deposits. For this cleaning procedure the engine needs to be stopped and secured. Open the inspection cover on top of the cooler and the drain valve. Spray undiluted Unitor™ ACC Plus™ into the tube nest, with e.g. a Unitor Jet Spray Unit, and allow to penetrate into the deposits for a minimum of 1 hour. Rinse thoroughly with a high pressure jet such as a Unitor High Pressure Machine. Close inspection cover and drain. For in-service cleaning of air coolers and the air-side of turbochargers, a solution of 25% Unitor™ ACC Plus™ in freshwater is recommended. The appropriate dosage of cleaner is then placed in the dosing pot and injected up stream of the air cooler for a period of 10 minutes. After a further 10 minutes, a similar quantity of fresh water is injected to rinse off the emulsified deposits. Rate and frequency of application depends mainly on the condition of the air coolers. However when starting with the use of Unitor™ ACC Plus™, recommended injection is every 24 hours. After the initial cleaning period, the cleaning effect should last for 48 hours of operational time. Although frequency of cleaning may vary, the calculated cleaning dose should remain the same. This cleaning method is only recommended if approved by the engine manufacturer!